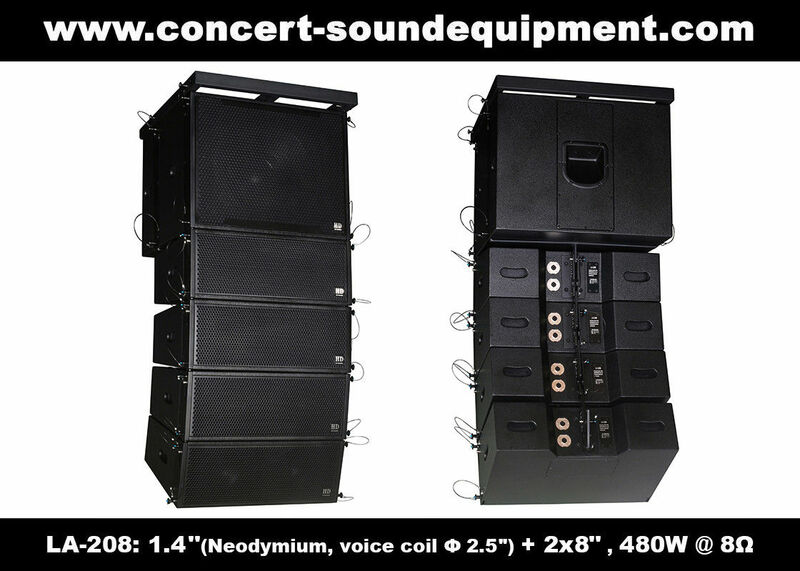 1.4"(Neodymium Driver, Voice Coil Φ 2.5")+2x8"
Full range line array speaker, 480W @ 8ohm, P.Audio 1.4"(voice coil diameter 2.5" ) Neodymium HF driver, 2pcs 8" ferrite drivers, compact plywood cabinet, good sound quality,for indoors applications and small outdoors events. 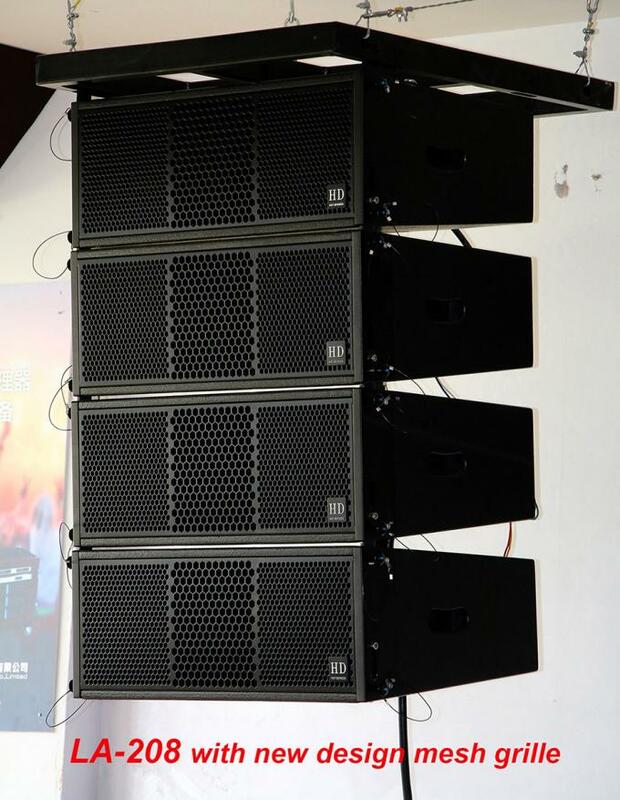 LA-208 + LA-208S line array speaker system is designed for small living event and indoors applications with high requirements on SPL, sound quality, stability, and dispersion. 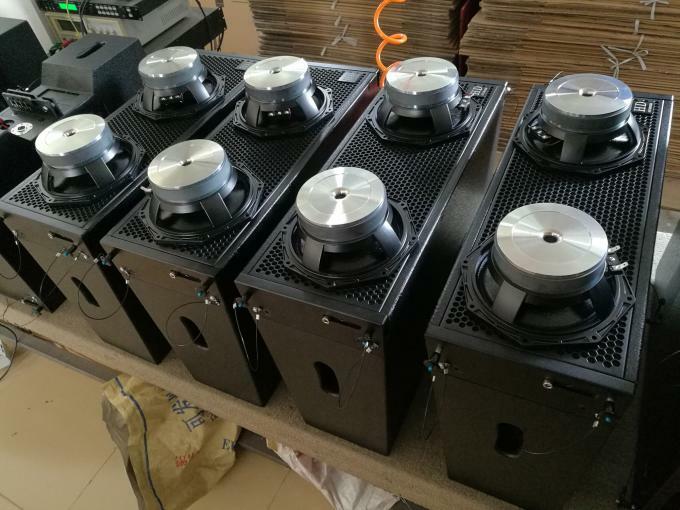 LA-208 is fixed with 1pcs P.AUDIO 1.4" neodymium HF driver(8 ohm) and 2pcs 8" Ferrite LF drivers(impedance for each: 8 ohm). 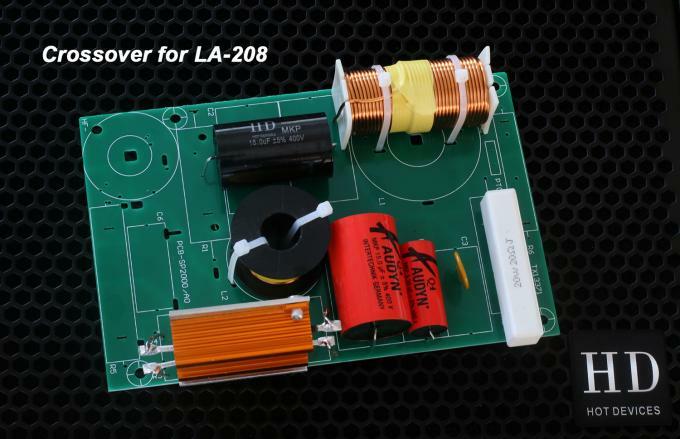 Crossover mode: PASSIVE(with built-in crossover,and the impedance for each LA-208 is 8 ohm) and German AUDYN capacitors are fixed at the crossover for HF driver to reproduce fast and clean sound. 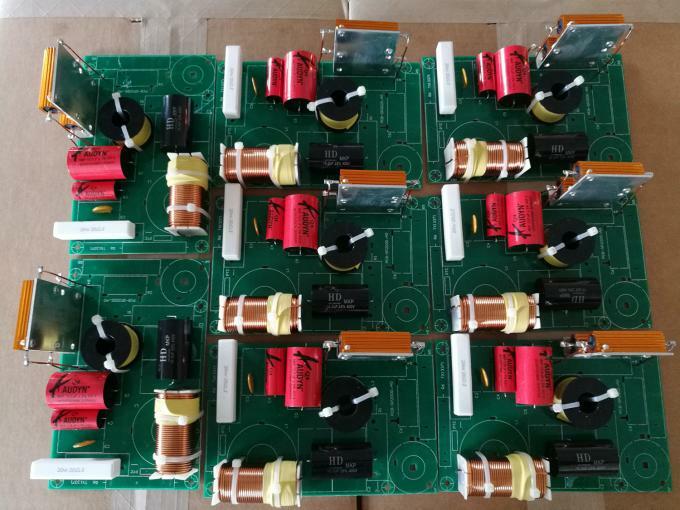 You can use our FP 10000Q(MST-4130) switching amplifiers to drive LA-208 speakers: 1pcs FP10000Q(MST-4130 has 4 channels, and each channel can drives 2 pcs LA-208 at 4 ohm. 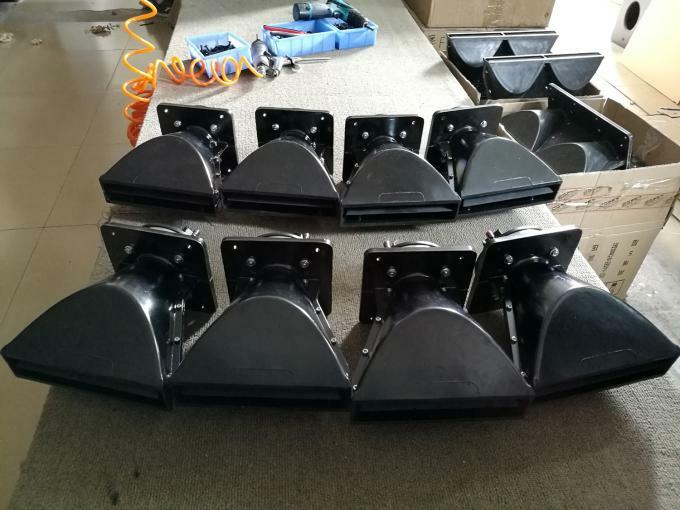 So, 1pcs FP10000Q(MST-4130) can drive atmost 8pcs LA-208. 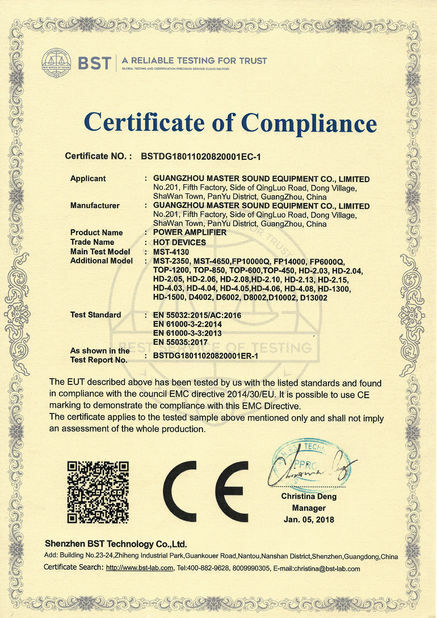 We pay closer attention on details than other Chinese suppliers. 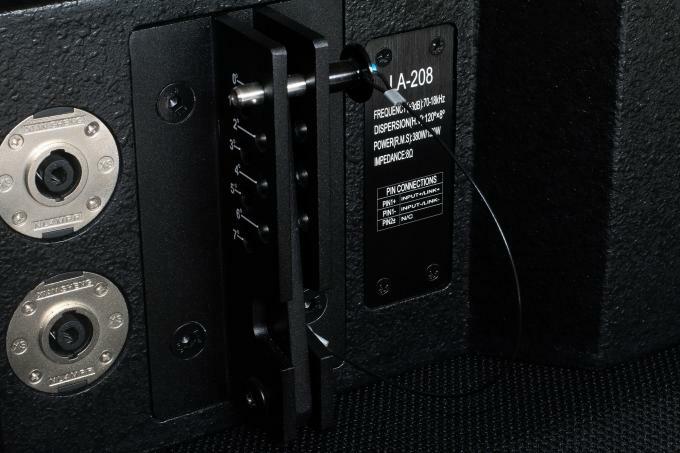 LA-208 is fixed with one aluminium panel at the cabinet back, and all letters are laser-engraved on the aluminium panel. 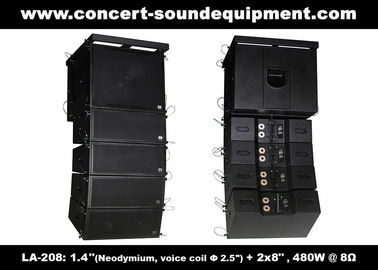 It makes the loudspeaker look more professional and higher end. 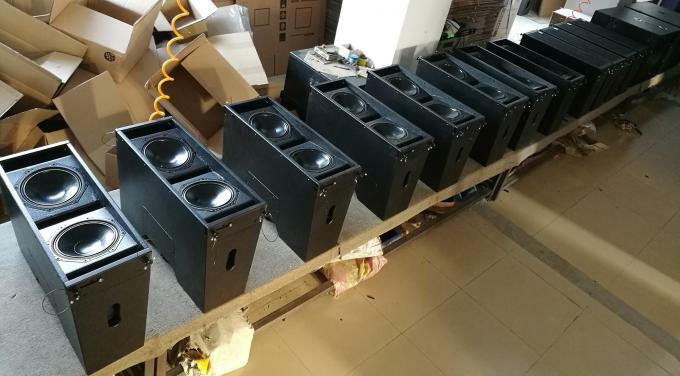 Sometimes, in order to get better sound or make the cabinet look more beautiful and professional, we may make some little changes with cabinet dimensions, cabinet interior structure, horn dispersion, flying hardware, and handle position. 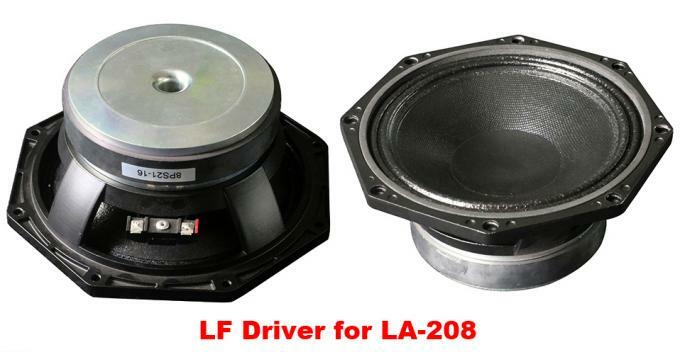 LA-208S is one compact subwoofer fixed with single 18" LF driver with power handling capacity 600W (rms). You can fly LA-208S together with LA-208, you can stack LA-208S on the ground as well. 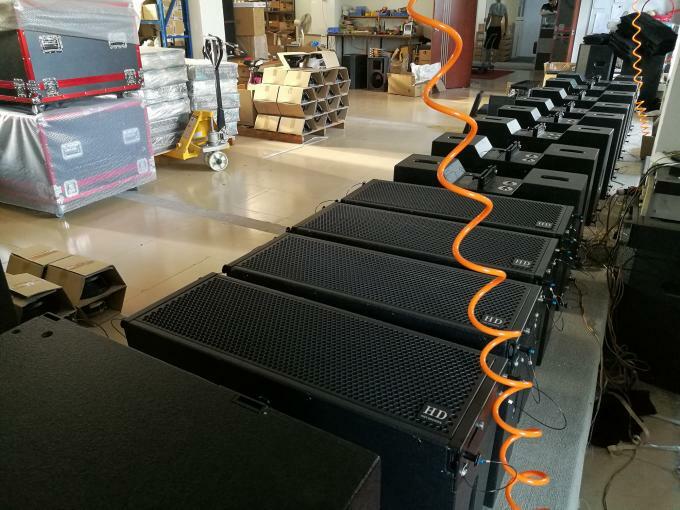 To set up LA-208 + LA-208S line array speaker system, you can choose our 4 channel switching amplifier FP 10000Q(MST-4130), and DC36(or DC48) signal processor,according to loudspeaker quantity. 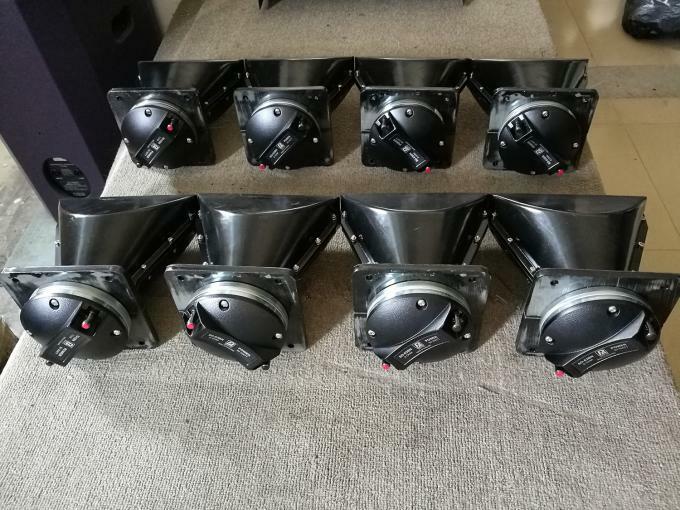 If you want dual 18" subwoofer(s) to put on the ground, then, you can choose our M-528B(direct radiating, for indoors applications) or LA-218SB(horn loaded design, mainly for outdoors applications). And you can choose our TOP-1200 analogue amplifier or FP 14000(MST-2350) switching amplifier to drive it. 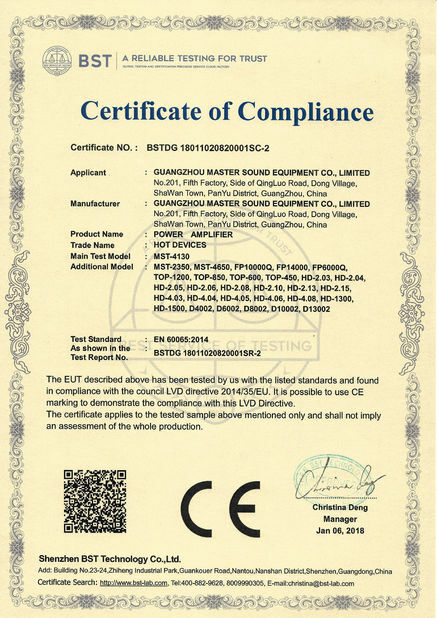 If LA-208 + LA-208S system can not meet your requirements, you can visit our website to find other options like LA-205 + LA-205S, LA-110 + LA-110S, LA-210 + LA-218SB, LA-212 + LA-218SB. Small living event,and indoors applications like club, conference, school, and church. 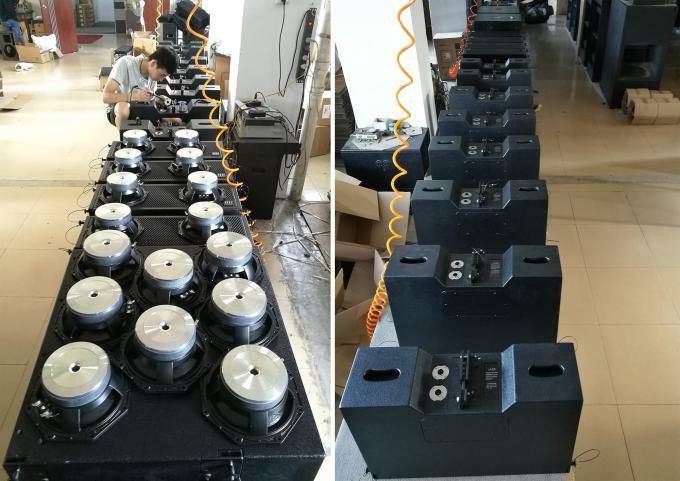 Components: 1.4"(Neodymium driver, voice coil Φ 2.5")+2x8" 1x18"